Saturdays at 8pm & 11pm! Monkeyman brings you our first fully independent production, a tribute to all the midnight movies and sci-fi marathons that made each one of us the freakish fanboys and fangirls we are today. 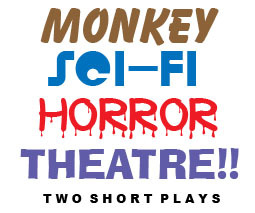 The last two weekends in May we will be offering a double feature of the most delicious geekish delights — a play of the tackiest TV sci-fi future, and a play documenting the less-than-horrifying side of the zombie apocalypse! Tell me you’re not thrilled already! ZOMBIE COSTUME CONTESTS EACH NIGHT AT INTERMISSION — WIN A PRIZE! We’re on set for the last day of shooting for Phoenix VII: The Final Rebirth, the latest film in the long-running sci-fi franchise. The guest star is none other than John Taylor, ‘Commodore Philk’ from the original 1960s television series – and when he’s not forgetting his lines, he’s hitting on the alien women and lecturing the cast on which way to lean when the ship is under attack. Can even the big screen contain an ego this size? Lindsey is thrilled to finally be on board the Phoenix after other commitments kept her from the first launch. Lindsey studied drama at University of Waterloo and has worked with companies like Hart House and Utopia Entertainment International since her return to her hometown of Toronto. Next up for her is the InspiraTO short play festival in June. She thanks her high park family and her first officer Mr. Moyle for revitalizing her inner geek! Favorite theatre projects include Pride & Prejudice, Private Lives, Gross Indecency, The Tin Drum, Rumours of Our Death, The Crucible, Hamlet, Much Ado About Nothing, Don Juan in Hell, The Fort at York, Side Man, The Diary of Anne Frank, The Floorboy, and four shows with Shakespeare and the Queen’s Men. On film: Road Rage, Dr. Jekyll, Attack of the Phantom Filmmaker’s New Empire, and the upcoming Sin Retorno. Scott is delighted to again work with his simian confreres. Leeman Kessler, Science Fiction Professional, is a Nigerian born American living it up in Toronto with nothing but his rich, velvety voice and winning manner to recommend him. He has worked with Monkeyman on multiple occasions as a werewolf, a mountie, a King Kong and occasionally as an actor. Available for parties. 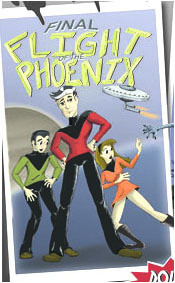 Paul Tamm is very pleased to be a part of the cast of Phoenix and has been having a great time. His favourite colours include (in chronological order): Orange, Blue, Red. When not piloting space vessels, he can be often found reading, pondering the nature of reality, or watching Star Trek (DS9). Hannah is excited to work with the Monkeymen once again! A Toronto native, she studied at the Player’s Academy as well as The American Academy of Dramatic Arts in NY. Hannah has worked with the Rebel Shakespeare Co. and The Berkshire Theatre Festival (Mass., U.S.)as well as The Alumnae Theatre and Cabbagetown Theatre here in Toronto. Hannah will soon be seen in the upcoming Romantic/Fanatic at the Toronto Fringe Festival. Becky’s pretty impressed with herself for almost understanding all of the references made in these two shows, but even more impressed with how much fun it has been to work on them. She’s currently going into her fourth year at Ryerson Theatre School for Performance Production, and acts as Company Manager for the docutheatre company Suburban Beast. She enjoys longboarding to rehearsal (when it’s not raining that is) and sometimes she even manages not to fall off and horribly injure herself. 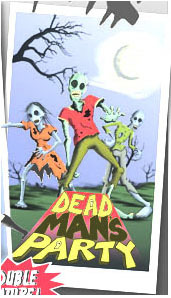 The zombie apocalypse has finally arrived, and the entire human race is under siege. But if you’re four nerdy guys who spent your lives playing XBox, reading comic books and arguing over countless games of D&D, the zombie apocalypse might be the best thing that ever could have happened to you. Martin Chodorek is very pleased to be both directing again and now acting (up) with his co-Monkeymen. Martin is a graduate of Ryerson Theatre School who has previously worked with Staged and Confused Productions, Canopy Theatre Company, Little Olga Productions, and Alumnae Theatre Company. Martin will next be on stage with Fool Productions in the Toronto Fringe Festival premiere of ‘Romantic / Fanatic’. D.J. has been active in theatre for over 20 years as an actor, technician, director and playwright in both the United States and Canada. He is the artistic director of Monkeyman Productions, and he couldn’t be happier with the company, the cast, the crew or the audiences his shows have drawn! Tim Nussey is a founding member of Monkeymen productions. Recent work has included Dr. Christie in “Wolf in the Fold”, Tim in the original performance of “Final Flight of the Phoenix”, and Kadin in “Godzilla on Sundays”. Tim is very excited and proud to step onto the stage with the three other Monkeymen, and of course to be in a play that not only has zombies, but also forces co-star Brad Rowe to have to pretend that he likes D&D. Well played D.J. Brad is a founding member of Monkeyman Productions and is thrilled to join the team on stage for the first time in Dead Man’s party as Joe. Brad has been acting since grade school and is psyched for future performances with Monkeyman. Thanks to all for coming out! When she is not fighting crime (or zombies) Davian can be found writing very small poems. She enjoys rainboots, humanitarianism and gifts with purchase. Past credits include Chance (New Ideas Festival), Wedding Belles (Toronto Fringe). Huge thanks to Monkeyman Productions (for all the good that they do). Eat local. Visit www.inspirereach.com. After an extended hiatus, M.J. Williams, an amateur comedienne in the late ’80’s, returns to the stage. Her previous artistic achievements include a stint with the NQRFA (Not Quite Ready For Anything) Players on the now defunct and rarely watched, “TV Breakfast”. M.J. now rises from the dead to fulfill her lifelong ambition of portraying a zombie-esque character in a small, theatrical production, held in the back room of pub. Graeme Casson is making his first foray onto the stage, after many years behind the scenes. He has stage managed shows for the Fringe Festival (Ishy Loves Gilgy) and Summerworks (Still Life) and is currently working at a school, helping kids discover their inner geek. He is also proud to have claimed Jedi as his religion on the last census. May the force be with you. Always. Mark is currently working on writing a novel and completing a screenplay between bouts of writer’s block and frequent graphic design projects. He first became involved with Monkeyman Productions by designing its logo and promotional images for two previous productions; Theatre of the Obsessed and The Nefarious Bed & Breakfast. Mark has been a long time supporter of Monkeyman Productions and is delighted to be staggering onto the stage as a zombie in Dead Man’s Party.